Silken velvet pumpkin: tabletop couture. Cinderella never dreamed of a pumpkin so luxurious. 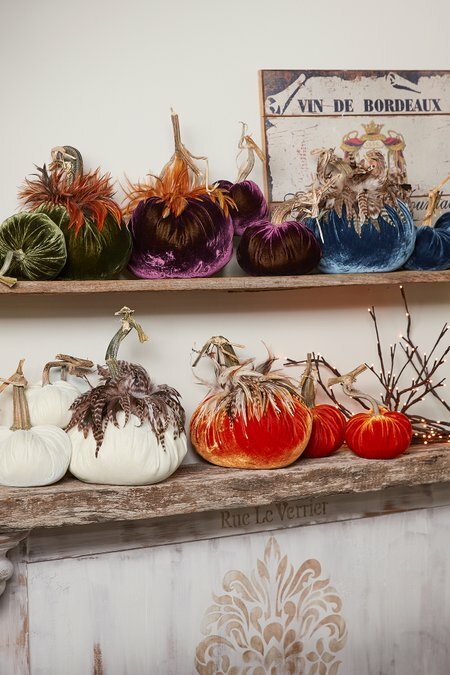 Handcrafted in the USA, these gorgeous pumpkins upcycle discarded pumpkin stems from Oregon farms and add the luxury of the finest silk velvet to create one-of-a-kind, designer pieces. They're filled with ground hazelnut shells and the largest style has a crowning of feathers. Perfectly proportioned for your tabletop or nook. Please handle by the base and not the stem. Small 5", Medium 6" or Large 10"